We return to Chalandri to celebrate head bartender Manolis Lykiardopoulos’ 5th position in the 2015 World Class competition! You need to get out of that ‘downtown only’ mentality in order to appreciate an all day bar (09.30-02.30 on weekdays and until 04.00 at weekends) in the centre of a shopping district or neighbourhood like Chalandri. 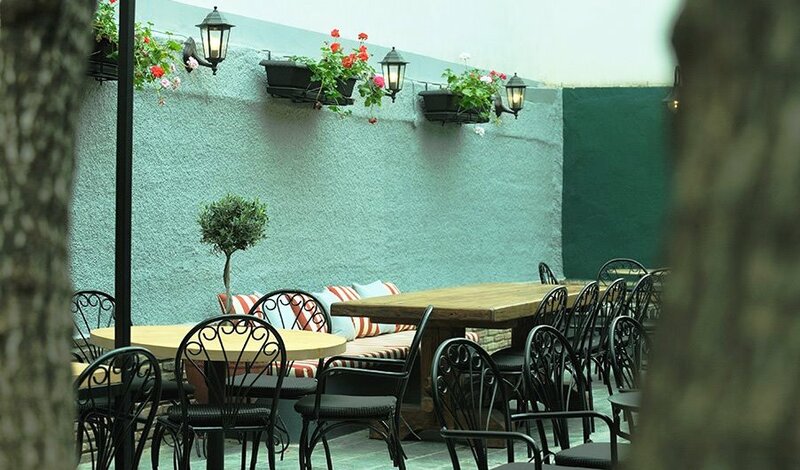 It means a mixed crowd brought together by the cosy feel of the hidden yard at the back of the Platonos arcade and the funky décor of the wine coloured room with the wood elements and multi-coloured tiles that adorn the bar. What others might have considered a handicap, owners Lelos Georgopoulos, Thanos Tsounakis and Yiorgos Kesaris have been able to turn into the key to their success. They have a menu which includes breakfast options, juices, teas and coffees as well as salads and snacks (mini hot dogs, burgers, tortillas and omelettes) prepared by Panayiotis Kazas and his team. This is what ‘& more’ stands for as it offers so much more than your average all day bar. Theory is staying true to the ideas set in place by Marfi Bali and Thodoris Pyrillos, who designed previous menus, by offering a great selection of spirits. There are many interesting options from the small but interesting cocktail menu; some classics with a twist (twisted signature cocktails) and the ‘team work cocktails’ put together by the bar team headed by Manolis Lykiardopoulos. Given my preference for bitter flavours, it’s not surprising that I opted for the Sparkling Negroni with gin, Aperol, Campari and red vermouth in a fizzy format. When I was told that they had run out of it, I settled for a well made Bergamot and Cardamom Margarita and then a Pico Apico with Tanqueray 10, blood orange puree, stevia syrup, egg whites and lemon juice, which proves why Lykiardopoulos was the Greek heat winner and 5th in line at the international World Class 2015 competition in South Africa. To top it all off the combination of Zacapa 23 with dried bananas and chocolate in the Fashionò Banana was not only amazingly balanced but a very well thought out cocktail. In my opinion, Theory bar could focus on these lovely cocktails even more so they can become the main attraction here.